These four Hubble images of Neptune were taken with the Wide Field Camera 3 on June 25-26, during the planet's 16-hour rotation. The snapshots were taken at roughly four-hour intervals, offering a full view of the planet. The images reveal high-altitude clouds in the northern and southern hemispheres. The clouds are composed of methane ice crystals. The giant planet experiences seasons just as Earth does, because it is tilted 29 degrees, similar to Earth's 23-degree tilt. Instead of lasting a few months, each of Neptune's seasons continues for about 40 years. 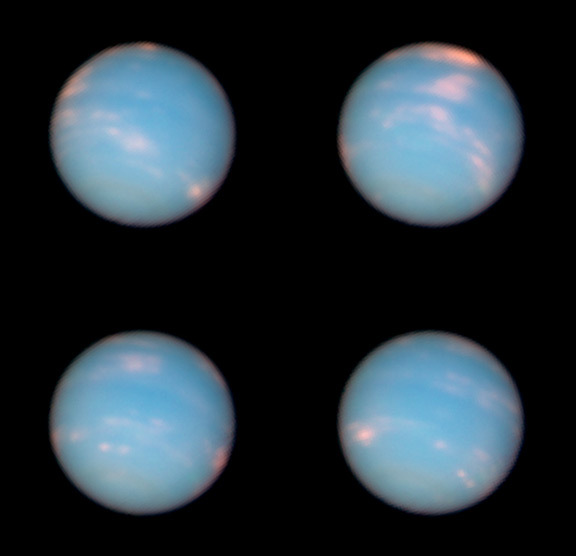 The snapshots show that Neptune has more clouds than a few years ago, when most of the clouds were in the southern hemisphere. These Hubble views reveal that the cloud activity is shifting to the northern hemisphere. It is early summer in the southern hemisphere and winter in the northern hemisphere. A faint, dark band near the bottom of the southern hemisphere is probably caused by a decrease in the hazes in the atmosphere that scatter blue light. The band was imaged by NASA's Voyager 2 spacecraft in 1989, and may be tied to circumpolar circulation created by high-velocity winds in that region. Twenty years later, Urbain Le Verrier of France and John Couch Adams of England, who were mathematicians and astronomers, independently predicted the location of the mystery planet by measuring how the gravity of a hypothetical unseen object could affect Uranus's path. Le Verrier sent a note describing his predicted location of the new planet to the German astronomer Johann Gottfried Galle at the Berlin Observatory. Over the course of two nights in 1846, Galle found and identified Neptune as a planet, less than a degree from Le Verrier's predicted position. The discovery was hailed as a major success for Newton's theory of gravity and the understanding of the universe. Galle was not the first to see Neptune. In December 1612, while observing Jupiter and its moons with his handmade telescope, astronomer Galileo Galilei recorded Neptune in his notebook, but as a star. More than a month later, in January 1613, he noted that the "star" appeared to have moved relative to other stars. But Galileo never identified Neptune as a planet, and apparently did not follow up those observations, so he failed to be credited with the discovery. Neptune is not visible to the naked eye, but may be seen in binoculars or a small telescope. It can be found in the constellation Aquarius, close to the boundary with Capricorn. Neptune-mass planets orbiting other stars may be common in our Milky Way galaxy. NASA's Kepler mission, launched in 2009 to hunt for Earth-size planets, is finding increasingly smaller extrasolar planets, including many the size of Neptune. Hubble is a project of international cooperation between NASA and the European Space Agency. Goddard manages the telescope. The Space Telescope Science Institute (STScI) conducts Hubble science operations. STScI is operated for NASA by the Association of Universities for Research in Astronomy Inc. in Washington.